Plexidor Pet Doors: Happy Endings! Everyone needs a sunshine story now and then, and I have one! The handsome boy on this photo is Merlin. Merlin was at a shelter in Sebring, Florida, and moved everyone through his shelter picture. The image showed a sad and frightened dog who did his best to hide through curling up in a corner. He was doomed, and he knew it. 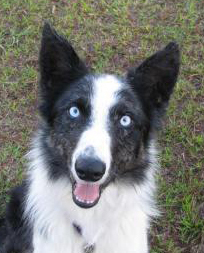 Luckily for Merlin, Ewenity Farms Border Collie Rescue saw him, and pulled him mere hours before he was to be put down. He got into the car with a look of, "Finally, I'm so glad someone came for me. Let's get out of here." Today, Merlin is a certified search and rescue dog. He has an important job and spends his time saving others.